NAMM 2011 PRESS RELEASE: Universal Audio (UA), a leading manufacturer of professional audio recording products, today announced the impending release of UAD-2 Satellite DUO and QUAD Firewire DSP Accelerator Packages. As the newest members of UA's award-winning UAD-2 Powered Plug-Ins platform, the UAD-2 Satellite family combines DSP acceleration with the plug-and-play simplicity of Firewire 800/400 — perfect for modern, Intel-based iMacs and MacBook Pros. The UAD-2 Satellite puts the entire UAD Powered Plug-Ins library within easy reach of Firewire 800 and 400-equipped computers; no PCIe card installation required. In developing these UAD plug-ins, UA's DSP engineers work with leading hardware manufacturers — including Roland, Neve, Studer, dbx, Solid State Logic, Lexicon, Manley, Empirical Labs, Trident, SPL, EMT and more — using their exact schematics, golden units, and experienced ears. This gives computer-based musicians and engineers the warmth and harmonics of classic analog recordings, wherever they mix. Available in DUO or QUAD processor format (with either two or four Analog Devices SHARC processors, respectively), UAD-2 Satellite packages provide a processing "boost" for digital audio workstations, and include a selection of classic analog emulation plug-ins, right out of the box. 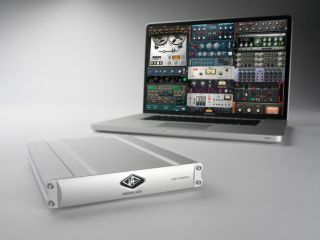 "This is a really exciting announcement, both for UA as a company, and for legions of musicians and engineers wanting to tap into UAD-2 plug-ins via Firewire," commented Universal Audio President Matt Ward. "The UAD-2 Satellite is a sleek, high-quality product that delivers even higher quality results." "UAD-2 Satellite is the result of UA listening to our customers, and giving them a processing solution that is both elegant and powerful,"
added UA Senior Product Manager Lev Perrey. "Coupled with our roadmap of exciting new plug-ins, we anticipate this product expanding our 40,000-strong UAD user base significantly in the years to come."